1. Are you trying to eliminate the Yellow and White Page books? These books have proved to be useful for some people. But with the use of technology today these books are becoming obsolete. The Yellow and White Page industry has failed to understand the social, economic, and political green movement across the country. This site is to stop the delivery of unwanted books to the people who did not want them. If I want a phone book, I will call and order one. 2. Do the Yellow and White Page industry promote recycling of their product? Yes, they do and even point you to a site called www.earth911.org/ so you can find the closest recycling center to take your used and or unwanted books for recycling. And this all sounds great except how much gas and energy is being used by the individual to go and recycle a telephone book that you did not want in the first place? So I am getting an unsolicited book and being told to recycle it. How about not giving it to me in the first place? 3. How many people recycle the book? No specific data is available but a random sample from this site shows people are recycling these books at a rate of less than 10%. Most respondents just throw them in the trash can. 4. 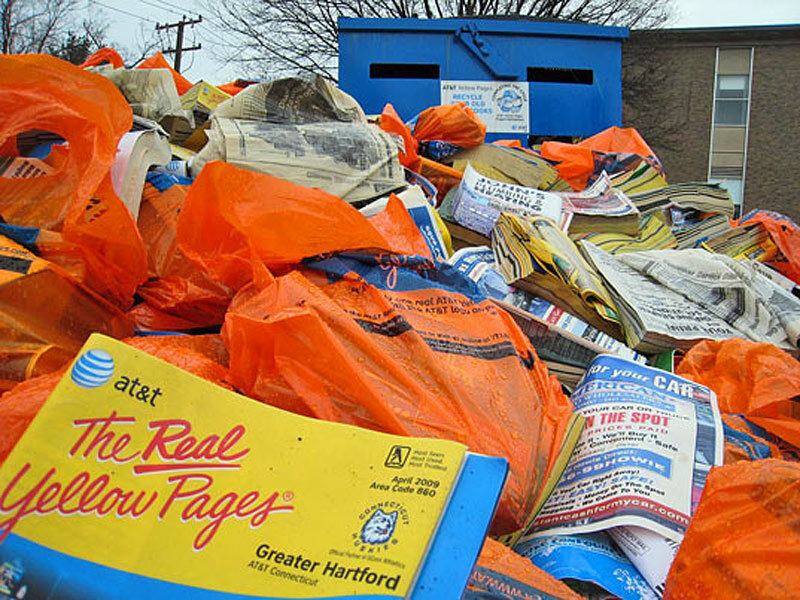 Is the Yellow Page and White Page book a profitable revenue source for the telephone company? Yes. The industry bases its ad cost on the number of books printed and delivered. A full page colored ad in the St. Louis, Missouri market cost $3,982 per month. A company will pay over $47,000 for an ad that is printed one time in a telephone book. The ad is static and cannot be changed to reflect the current conditions of that company or the industry it is marketing. 5. When I sign the form am I automatically removed from having the telephone book delivered? There is no national no-delivery organization like the National Do Not Call Registry https://www.donotcall.gov/ . Individual Yellow and White Page organizations state that you can call them and they will put you on a list to not deliver books. Keep in mind, they are not held liable or accountable if the book shows up anyway. www.YellowPagesGoesGreen.org will redirect you to the yellow pages association main site, where you will find the "opt out" form for individuals and businesses to cancel your delivery. It then will be the responsibility of the publishers to act in accordance to the consumer's demands. 6. Why are we doing this? To provide the names of people who do not to receive the telephone books to the Yellow and White Page industry to stop the unsolicited delivery of 540 million books per year to the populace. If we want a book, we will call for one. The amount of natural resources being used is almost criminal in this age of technology. 7. Does this campaign cost anything? No. This is a true grassroots campaign that relies on the word of mouth of the participants. The goal of this campaign is to get the industry to change or we will seek to have legislative involvement to get a National No Delivery Register..
8. Is my personal information going to be used or sold to anyone? No. Your information is proprietary and will not be used by anyone for any means other than to support this campaign. Even if you sign up for an ad or advertise on our web site, your credit card information is safe and secure. 9. I noticed the White ages records my IP address when I use the directory to find people. How long are the IPs you collect for each visitor to a page kept? The IP Address on the profile page of the White Pages is stored and displayed temporarily for 12 hours. 10. How can I help support this movement? Please forward this site information to as many people as you can, www.yellowpagesgoesgreen.org. We are looking to have a million registered participants within the next 12 months. Please spread the word through e-mail and blog content. 11. What would I use if I did not have a Yellow or White Page book? We have developed our own alternative to the Yellow Pages which is free for you to use and utilize to find what you need. Our service is continually changed and kept current so you are not potentially looking at several months or even year old information. If you would like to e-mail us, please click here for our contact form. For a complete list of our web assets click here.